Challenger’s soul-stirring flights during the Star Spangled Banner have inspired many millions of Americans, and honor American servicemen and women, along with first responders, who bravely and unselfishly serve and protect our country at home and abroad. The non-profit American Eagle Foundation (WWW.EAGLES.ORG), cares for the 28-year-old male bald eagle for educational purposes under federal and state wildlife permits. The AEF was established in 1985 and is headquartered at Dollywood in Pigeon Forge, TN. Challenger was blown from a wild nest in a storm as a baby and was hand raised by some well-meaning people who rescued him. Consequently, he became a “human-imprint” after being fed by people at a young age and thereafter could not survive on his own in the wild. 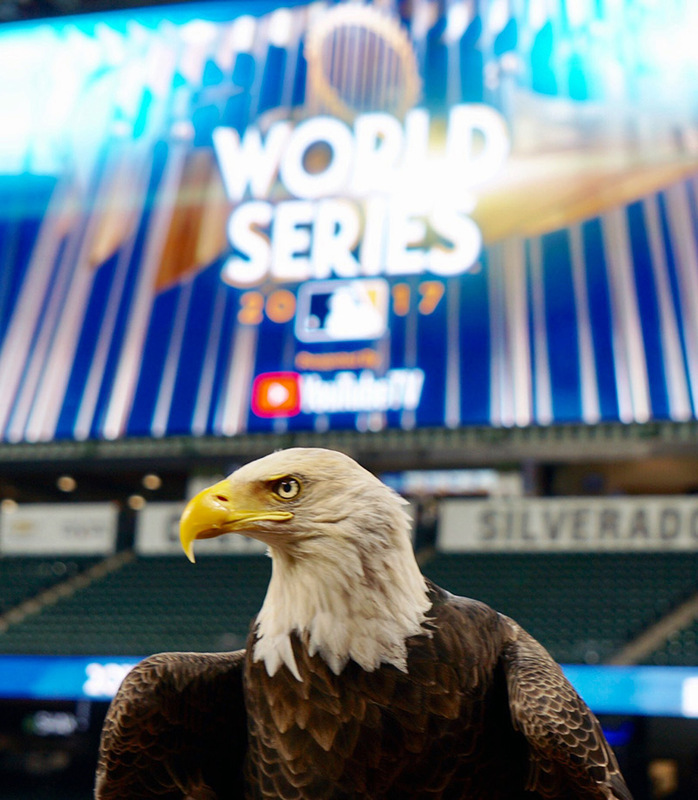 Over the past two decades, the celebrity eagle has appeared at numerous major sporting events across the United States, including 10 previous World Series games, over 75 NFL games, the Daytona 500, Indianapolis 500, NCAA Men’s Final Four, NCAA Women’s Final Four, NFL Pro-Bowl All-Star Games, NFL’s AFC Championships, NCAA Baseball World Series, Fiesta Bowls, BCS National Championships, Cotton Bowls, and NCAA National College Football Championship.